Too often we go through the motions of training, without actually getting the full benefits of our time and energy. In this section we will concentrate on how to create deliberate training routines and relate those to improvements in competition. An easy way to start deliberately working towards a goal is pretty simple and doesn't require a huge amount of oversight or outside opinion. It starts with breaking down the things you want to to work into their most basic parts, concepts and movements, then slowly increasing the complexity of what I am drilling until the parts start to rattle loose. What I mean is that you keep adding until the movements or the drills don't function the way they need to and to each person this may be different. This idea, as an overall concept, isn't too much different than the general "crawl, walk, run" approach to training. First we do warm-up movements and solo drills, then partner movements and technical improvement, then we do progressively more live drilling, and lastly is "live". I do want to emphasize though that this is very scalable. Live training may be 6 minute goes to prepare you for a specific competition. It may be MMA rounds, it could be live but only in the context of one position or one set of positions and end states. In this context, I mean live rolling as a terminal training idea. It is the most free form of training you can do while still maintaining the technical ability to work and also understand what is happening. If we were doing live MMA training, and you had never grappled, it would be hard for you to really improve on the areas of which you have little to no comparative ability in this setting. Note: Depending on the skill gaps between partners, the level of how "live" the person is going may be different. 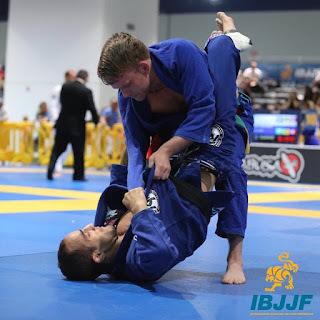 If a high level BJJ practitioner is training with a relative beginner, it may be wise to have the higher level player doing very specific drills and limiting their game to specific attacks they want to work and develop - even at the cost of their ability to "win" every position - but for the more new athlete they could, situational dependent, use it as an opportunity to move and explorer and not be as limited in their approach. - Start off by doing your normal warm ups and movements. - Progress to adding in movements specific to your hoped improvement. In this example, we will work on improving the long step pass. - From above, some specific movements may start with hip switching down the mat and learning to move your hips and upper body correctly for the pass. - Next we add in some partner technical work. What ways can you break down a long step pass? One approach may be to start at the end of the pass and practice just the final hip switch and long step from the correct grip and hip position. Then, back off one step and go all the way through to the end again. Recursively keep doing this until you are working on guard entries and specific ways of getting to their from different guards. - Now add some resistance. The end state is for the person working the technique to win, but we progressively give them a bit more and more resistance. We shouldn't, for this section, be causing the opponent to fail, but this starts to build on their skills, confidence, and awareness of the position. - Ready, Fire, Aim. In this portion the opponent is working hard enough to cause you to sometimes not be completely successful and you need to start the technique and start to see the common near pass positions it puts you in. This allows you to start to work on your timing and chaining of techniques. At the completion of this phase, you should be more prepared to execute the technique from more positions and start to be confident in your ability to finish and adjust the movement during execution. - As you begin to ramp up resistance, may now the opponent can attempt to sweep and submit you at 100% effort. Maybe if you are able to still execute your passing to a high level then you work on getting from other positions to the guard pass, such as from the feet or from bottom. Its possible if you don't have the tools to go from one of this other positions to the one you worked, then you have to start the process over again for those positions. Its also possible that instead you start working on the positions after the pass, like stabilizing top or advancing and submitting. At this point, it becomes very individualized. - Just remember, as you keep adding to the options and openness of your training, the number of skills in play increases. When you start to see certain areas where you begin to not be successful or it doesn't feel right, back off one or two steps from that position and work it until you address the problem. As another note: I do this while I am grappling "live" all the time. I dictate how I train, and I don't always need my partner to be completely compliant. Depending on who I am training with, as I said above, I work on different parts of my game. If I was training with someone of the same skill level, I may roll more "live" and see what they are able to exploit. If I am going with someone that I feel I could submit or out position, I work on increasingly more specific and limited parts of my game while they attempt to avoid or beat the skill set I am developing. So we have the increase in technical ability, awareness and all the other benefits of the aforementioned training, but as we start to implement tournament specific training there may be some specific things we can do to help. Grappling until submission / Grind sessions: These can be good to build mental toughness. The idea is that you can't ride the clock out and avoid submission long enough to get saved by the bell and get out of bad positions. There are some drawbacks here because sometimes it can encourage being overly conservative and doesn't necessarily emphasize the required tactical risk taking that competition does. Match length sessions (w/ tournament rules): This can prepare you to be able to internally judge how long your matches are and make the pacing and structure more routine. For this to really work, you need to emulate the match as much as possible. Start from the feet, shake hands, go for length. The draw back of too much training like this can that it is so specific that the crossover isn't as great as some other styles of training, but its ability to make matches routine helps. Short duration high intensity goes: Limited goes create a sense of urgency and eliminate the cost of failure. An example would be position drilling until a position change or submission. If I am working the pass and I fail, I don't spend the next 6 minutes in bottom side control. We restart. This allows me to repetitiously wok the position without as large of consequence and gives me a large sample size to see what I need to work on. Some of the downfalls is that it doesn't emphasize control and transitions as much as other types might, but is great for skill development. Flow and timing goes: These can be great to just increase awareness and get people moving around. This also has some of the lowest chances of injury and are great for newer people to just learn to move and be mentally agile, which is a hard skill for most beginners. That leads to two of its largest downfalls, firstly its hard for new people to actually do this because they don't have any depth of skill to work with and secondly it doesn't prepare you for the intensity of more rigorous goes. It does provide a great platform for skill development though. Timing, Flowing, and Short Duration goes should be, in my opinion by the bulk of your "live" goes. And important idea to reiterate is that if your opponent wants to flow but you are working on other parts of your game, you can use that as an opportunity to flow drill specific moves and how to transition in and out of them. I think that often people just flow aimless and allow their opponent to control initiative, but for me - even when flowing - I have things I want to specifically work and get to. this requires me to really be inventive with how I view certain positions and transitions. If you are having trouble finding partners willing to do certain live drills with you, a tactic is drill bad positions with those people and let them go harder. Strangely, most people don't have a problem with harder drilling when they are starting in the better positions, but the improvements you will make during the bad position drilling and the mental confidence you will have can make a big difference. If you aren't scared of being on bottom because you know you can still escape and win, then you are much more confident to attack and move. With the increased confidence, your success will be more likely. In between matches is a perfect time to practice your recovery routine. If you are doing an open mat without a structured warm up (or show up before the structured warm up), you can practice your pre-competition routine. This gives you a chance, in training, to see the efficacy of these routines and adjust them. This also allows you to add into your pre-competition routine specific ground up drill (as discussed in the first section of this article) targeted at positions and things you want to emphasize in the tournaments matches. An example of this you can see often is before MMA fights, you can see UFC fighters drilling specific things to prime them into their brains. Start simple and work up. Build up the movements and make them as perfect as you can. 1. I go through my mental checklist of things to get my arousal level under control (more on that later). 2. I begin slow basic movements and work up to dynamic solo movements. 3. Next I work some partner drills and basic techniques / positions I expect to encounter. One of the main things I personally focus on is starting grips and posturing or breaking guard posture. Its almost certain you will see those things in every match. These fundamentals help create my mindset in these positions. 4. I work some live situational drilling of progressing resistance, always ending in successful completion of the series. For arousal control, it's very subjective to each person. In fact, in my own life, its changed dramatically. So I have to find whats best by two methods, the first is by what makes me train the best and at what intensity I am doing the best mentally and physically in practice. And lastly is by evidence gathered by competing. A few things to consider: If you are "gassed out" in your first match, why do you think that is? Do you ever gas out in under 10 minutes in the gym, even in bad positions? Do you feel more technical during your first match of the entire day or as the day goes on a bit? Most people feel better after a few matches. Why would you want your first tournament match to also be the first live grappling of the day? If you have trained your cardio and technique correctly, getting in some specific live drilling before the match will not hurt your performance and instead will make a huge difference. I mostly see that people underwarm up in general, both physically and mentally, and they suffer for it. Stay tuned for Part 3, which will talk about cue words and what to do during matches!